Awesome customer service at MotorcycleGear.com. Ordered a new helmet and was between sizes and shapes. The staff in the chat room walked me through the process and got me into the correct size and shape. I'll admit, I was apprehensive when the UPS truck pulled up, but the helmet fits beautifully. 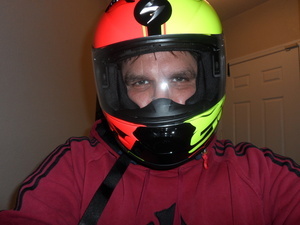 It's liner is as good as top of the line Suomy and Arai helmets I own at a fraction of the price. This Scorpion is also lighter and quieter than my Soumy Spec-1R and Arai Quantum II. Nice job guys on both the fit and the product advise!